When 11-year-old Kylie Simonds of Connecticut in America was asked to design something for a school project, she knew her battle against cancer would be the inspiration for her creation. 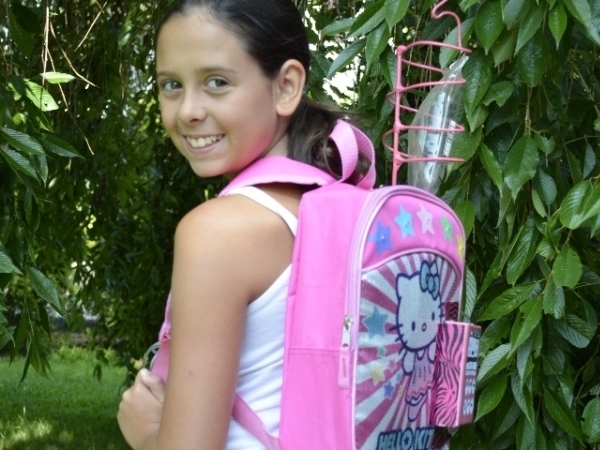 The inventive primary schoolgirl then set about designing a special rucksack which cancer sufferers can use to receive their intravenous chemotherapy. Kylie was diagnosed with tissue cancer three years ago and remembers the clumsy, impractical machine through which she received her chemotherapy. Although chemotherapy can take up to eight hours, the children often remain mobile and would be able to receive their therapy and continue with their normal activities were it not for the fact they have to push the machine wherever they go. “I used to have to use the IV poles and I always tripped on the wiring. It was difficult to walk and I always had to have someone to push the machine for me because I was kinda weak in chemo,” she told WTNH.com. That’s why Kylie designed her intravenous rucksack for children. This will allow cancer sufferers to receive their chemotherapy comfortably. The patient’s drip and medication are built into the rucksack and it’s lightweight and easy to carry round. Not only were her teachers impressed with the invention, but the rucksack also won an award at a recent inventors’ conference in her hometown. She was honoured with the conference’s highest award for the best invention and, in addition, her rucksack is going to be patented.